GRSMB’s paralegals are promoting two community service efforts this holiday season. 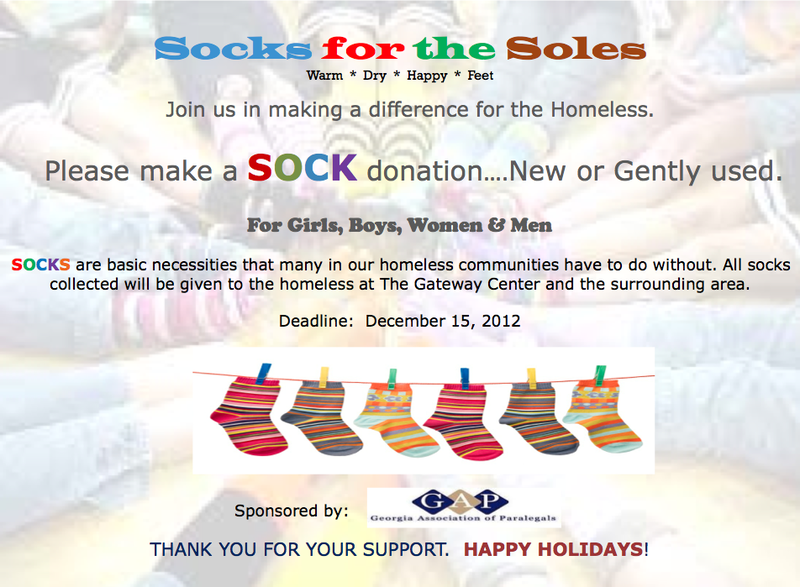 Socks for the Sole is a project that GAP (Georgia Association of Paralegals) are doing for the Gateway Center, which is a homeless shelter here in Atlanta. The Center houses families from all walks of life who are homeless and in need of the basics necessities. The GAP is always volunteering to do things for this center because it is one of a few of Atlanta’s homeless shelters that allow families to enter its doors. For the Christmas Toy Drive, toys are collected by GAP members and then they are taken to the Truancy Intervention Project of Georgia, Inc. Then the toys are divided and distributed to families that have signed up to receive the toys. The GAP picks a day in December (about two weeks from Christmas) to go by TIP and pick up bags of gifts to deliver to people’s homes. If individuals would like to donate directly they can contact TIP at 404-613-4741 to set up a donation drop off. Last year James, Patrick and Shakena drove around Atlanta dropping off Christmas gifts to the families that are a part of this program. “To see the look of appreciation, joy and utter excitement in the faces of these families is indescribable,” GRSMB paralegal Shakena Sterling said. Paralegals from GRSMB James Benson, Shakena Sterling, Rhonda Mitcshele, Amy Grizzell and Kara Kaiser are highly involved in the GAP and proponents of its community service efforts. All the paralegals at GRSMB are members and promote their projects among the firm, who then are also able to participate and donate.